Rio Grande’s Lucy Williams, left, finished fourth overall and earned a spot in the upcoming NAIA Women’s Cross Country National Championship during Saturday’s River States Conference Championship at Yellow Creek Park in Owensboro, Ky.
OWENSBORO, Ky. — University of Rio Grande senior Lucy Williams earned a spot in the NAIA National Championship as an individual, while helping the RedStorm earn a sixth place finish as a team in Saturday’s River States Conference Women’s Cross Country Championships at Yellow Creek Park. Williams, a native of Albany, Ohio, finished the 5K course in a time of 18:36 and placed fourth overall, earning first team All-RSC honors in the process. By virtue of being one of the top six finishers who was not a member of the winning team, Williams also punched her ticket to participate in the NAIA National Championship on Friday, Nov. 16, in Cedar Rapids, Iowa. 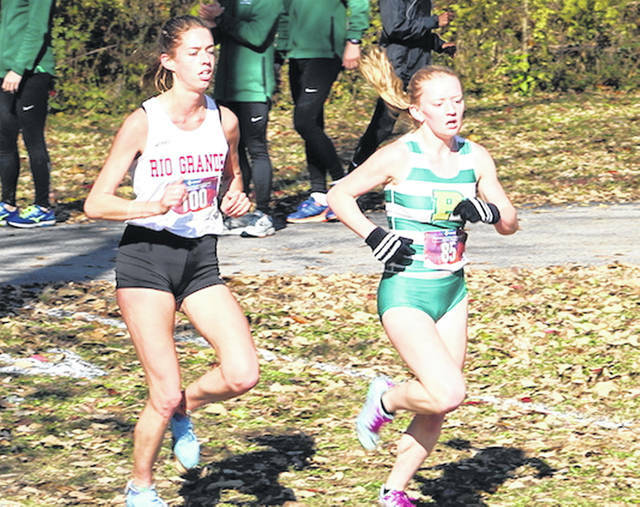 Rio Grande, which had just three regular competitors for most of the season and was ranked last in the league entering the race, added three more runners to the squad and totaled 160 points for a sixth place showing. Point Park (Pa.) University made it back-to-back championships and three titles in four years, with five of the top 10 finishers and 28 points to top the team standings. Indiana University East was second with 85 points, edging Ohio Christian University which was third with 86 points. Point Park’s Anna Shields won her second straight RSC individual title by placing first overall with a course-record time of 17:42. The NAIA All-American was once again named the RSC Women’s Cross Country Runner of the Year. Point Park freshman Alyssa Campbell placed second individually on her way to claiming RSC Women’s Cross Country Newcomer of the Year. She posted a time of 18:28. Point Park swept the individual awards with head coach Kelly Parsley being voted RSC Women’s Cross Country Coach of the Year. The top seven finishers earned All-RSC First Team honors with the next seven being tabbed All-RSC Second Team. Point Park, which is currently ranked No. 18 in the NAIA Top 25 coaches’ poll, advances as a team to the NAIA National Championship. Runner-up IU East also will advance if it is ranked in the Top 30 of Monday’s final rankings. Barring IU East earning a selection as team, the list of individuals joining Williams at the national event would include Ohio Christian’s Ariel Young (3rd place, 18:30), Indiana University Kokomo’s Brittany Slong (5th, 18:56), Ashley Toscholog (7th, 19:08) from IU East, Ohio Christian’s Alyssa Turrentine (8th 19:16) and Lexi Jackson (11th, 19:30) from IU Kokomo. The remainder of Rio’s representatives in the race included freshman Abalena Sullivan (Chillicothe, OH), who earned second team All-RSC honors by finishing 12th in a time of 19:30; junior Kelsey Miller (Georgetown, OH), who was 33rd in the 103-runner field with a finish of 21:19; senior Taylor Grubb (Thornville, OH), who placed 58th with a time of 22:31; sophomore Taylor Tackett (Hillsboro, OH), who was 61st after crossing in 22:37; sophomore Rachael Barber (Ashland, KY), who finished 95th in 26:42; and freshman Sarah Shepard (Carroll, OH), who was 100th in a time of 27:31. The conference also named its Champions of Character Team, which included one member from each squad who was nominated by her head coach and who best exhibits the five character values of NAIA Champions of Charater of respect, responsibility, servant leadership and sportsmanship. Grubb was Rio’s honoree on the team.